In a medium saucepan, place cauliflower and chicken broth; bring to a boil and cover. Reduce heat to low-medium and simmer until cauliflower is very soft and tender and chicken broth has completely cooked into the cauliflower (about 20 to 30 minutes). Make sure there is no liquid left at all in the bottom of the pan (remove the cover, if necessary and cook until any remaining liquid is gone and the cauliflower is no longer wet looking). Remove pan from heat; add cream cheese and heavy cream. 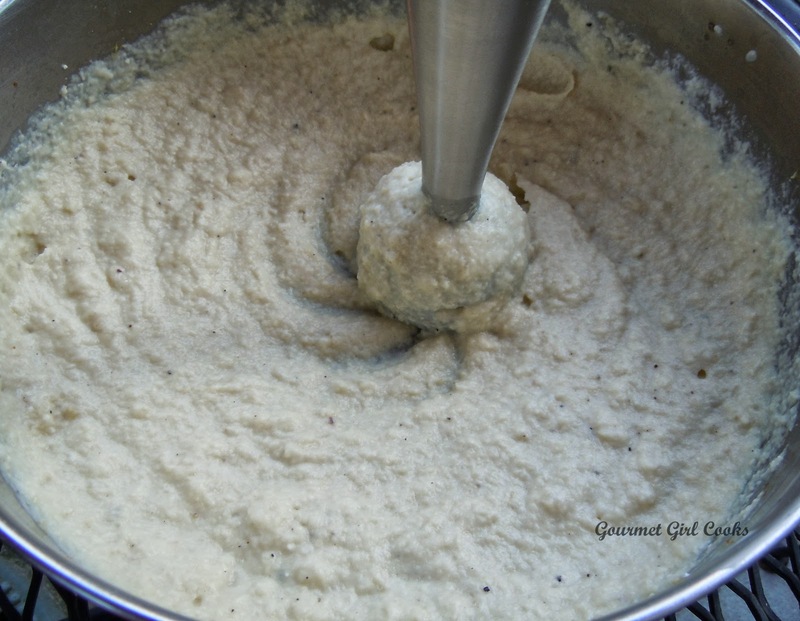 Using an immersion blender stick, blend or puree the cauliflower until the cheese and cream are fully incorporated and the mixture is smooth. Add grated Parmesan cheese and salt and pepper, to taste. Blend another minute; add optional butter, if desired. Adjust seasoning. Add additional cream to thin or additional cream cheese and/or Parmesan to thicken as necessary. 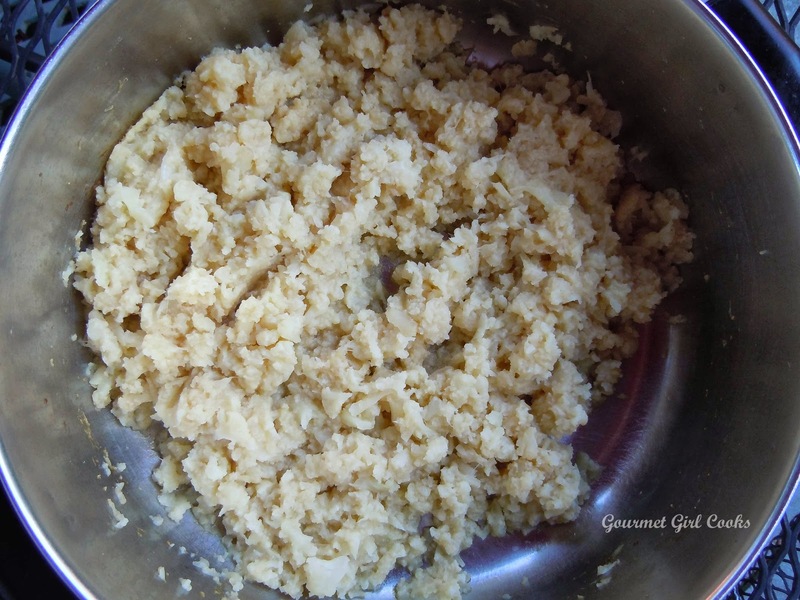 The cauliflower mash should be thick and not runny. *Note - If you don't have an immersion blender stick, this can be mashed and blended by hand with a potato masher or hand mixer (it just won't be quite as smooth). Cauliflower has a special place in my heart. I think of it as nothing short of a miracle food. About a year ago, mashed cauliflower was the first low-carb substitution I tried. I was amazed to discover that it makes the tastiest mashed "potatoes" ever! Next came cauliflower "rice," and I was equally blown away. I knew right then that the wheat/grain-free, low-carb lifestyle had a good chance of working for me! I still enjoy these "staples" frequently. 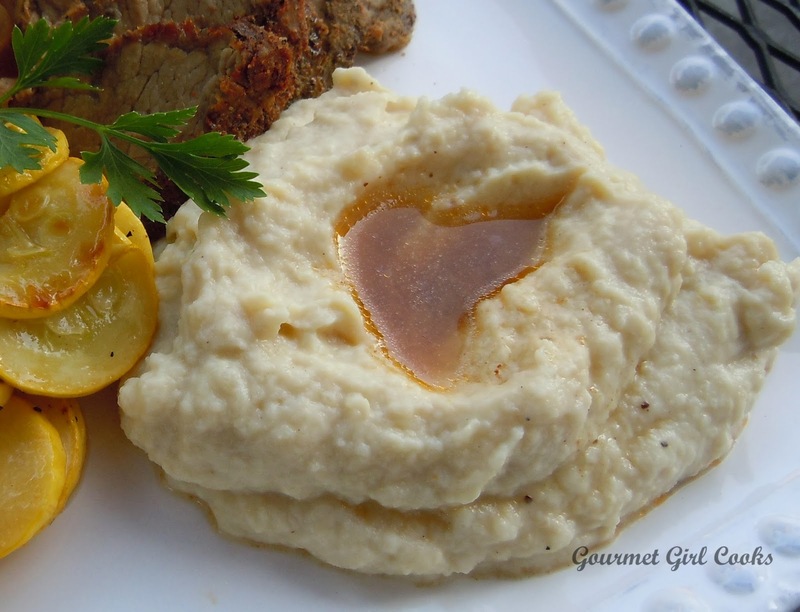 LOVE mashed cauliflower. Your recipe is close to mine and cream cheese is totally the secret to it being CREAMY! Cream cheese is a fantastic idea! I had forgotten about that! Excellent! Yummy 10X! I've been making a version of this for awhile now, but yours sounds even better - looking forward to trying it with the cream cheese. Two questions on your tri-tip roast - did you add any liquid to your slow cooker or brown the roast first? Also, while you've told us about your typical breakfast of Greek yogurt (and your delicious weekend repasts), what do you usually eat for lunch? I don't often have leftovers from the previous night's dinner (or am saving them for another dinner) and need some quick & easy ideas. Thanks for all the great recipes you share! Seasoning Rub -- I mixed approximately 1/2 teaspoon of each: sea salt, freshly ground black pepper, smoked paprika, ground ancho chile pepper, and then about 1/4 teaspoon each onion powder and garlic powder -- I placed a very thinly sliced small-medium sized onion in the bottom of the crock pot so the roast would sit on top of the onion and not directly on the bottom of the pot. I placed my spice rubbed roast on top, covered the crock pot and turned it on high for the first 1-1/2 hours and then down to low for the remaining 6-1/2 hours of slow cooking. I did not add any liquid. The "au jus" that was created as the roast cooked was a very concentrated flavorful juice made up entirely of beef juices and the little bit of liquid in the onion mixed with the spices and seasonings and was not diluted with anything other liquid. It produced approximately 2 cups of juice. Now...if you were going to leave the house all day long for 8+ hours or so, I would probably add about 1/4 cup of liquid to the pot to make sure it stayed moist. I added a touch more salt and pepper to the au jus. P.S. -- when I made the roast yesterday, I actually started it around midnight and cooked it overnight and all day until 5:00 pm. It cooked about 17 hours. I let it sit and cool a bit, thinly sliced it and placed it back into the juices in the crock pot and covered on low for about 30 minutes to infuse the juice into the meat -- makes it super tender. Happy Thanksgiving! perfect timing on the post! How can I make ahead and reheat a triple batch? I make this often but reheating this time would be much more convenient! I did in fact make a triple batch of the Cauliflower the day before, let it cool, refrigerated it, then the next day put it in a covered casserole dis and reheated it...perfect. Thanks for your advice and keep cookin'! I made these today and I am so glad! They are so, so good! Thank you! It will depend on your portion size. Cauliflower is generally quite low in carbs. Here is the nutrition calculator I like to use. (some folks like to use my fitness pal or others instead). It all depends on your portion size. Cauliflower is generally quite low in carbs. Here is the nutrition calculator I like to use. (some folks like to use my fitness pal or others instead). Steamed cauli usually has a strong taste for me. 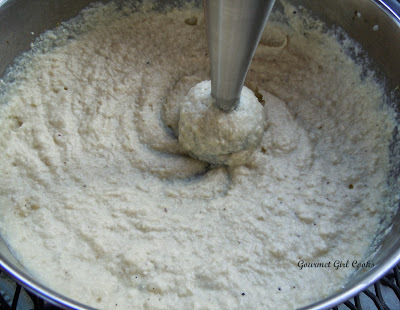 Does making your mash...which sounds luscious...help to mitigate that taste due to the cream cheese and Parmesan? How strongly does the cauliflower taste come through? I don't think it tastes strong at all. First of all, it's cooked in chicken broth (not water) until all broth is absorbed which flavors the cauliflower. Then it is mashed with cream cheese, cream and Parmesan which all further flavor it and make the texture thick and creamy. I don't feel it tastes strongly of cauliflower at all; I would say the Parmesan is the predominant flavor to me. This does not taste like steamed cauliflower. See my response above to Wanda. Thanks! I just wanted to profusely thank you for this recipe. I've tried my hand at caulimash many a time and have been disappointed. It's always been watery and obviously cauliflower. This, however, this...the angels sing! They taste just like whipped potatoes. It's all I can do not to eat the whole pot! And now I'm kicking myself for owning an immersion blender for over a year before I broke it out. So thank you, thank you, thank you!